At CityLab, Alana Samuels posed a great question: Why are developers still building sprawl? Even as surveys show many people they want walkable communities, the builders keep producing car-oriented sprawl, she writes. Samuels looked at Los Vegas and Atlanta, two of America’s most sprawling cities, and so her samples may not represent all of America. Yet she has a point: Builders are constructing very similar “product” as they were 10 years ago—just not as much of it. Land use regulations and trillions of dollars in existing public infrastructure make alternatives to sprawl extremely difficult outside of historic cities and towns, which have limited open land. In other words: Codes and roads are a big problem. Samuels reports on Inspirada, a Las Vegas master-planned community. It was launched with access from publicly-built, high-speed arterial roads located many miles from any walkable place. The Walk Score is zero. A developer would need tremendous intelligence, patience, and commitment to create an urban place—battling zoning regulations and the DOT at every step. KB Homes, one of the nation’s largest builders, lacks that long-term thinking and is unwilling to fight the system. So they build sprawl. It has less to do with the market and more to do with builders following the path of least resistance. That’s generally the case among builders who concentrate on single-family houses, which comprise about 6 in 10 new residential units in America. Another part of the development industry—multifamily and commercial real estate—has made tremendous strides towards smart growth in the last decade. Two decades ago, multifamily in America was mostly built in suburban “garden apartment” complexes—not so different from Inspirada, but denser. Now, in many markets, most of the apartment construction has shifted to walkable urban places. A similar trend has overtaken office construction, because businesses want to located in mixed-use centers to attract educated employees. With apartments and offices, “codes and roads” are less of an issue. Developers can pick an infill location with existing walkable infrastructure where the regulations allow higher density. Even when commercial real estate developers must create new infrastructure, they can pick their battles and the benefits are often worth the effort. Land use regulations, street policies, and finance issues still pose problems—but this segment of the development industry has been more able to adapt to market changes. 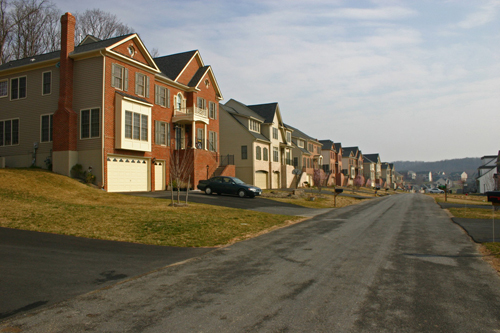 The single-family home industry has a culture of sprawl that goes back many generations. It needs help from the public sector to build walkable communities. First, communities need form-based codes that enable compact, mixed-use neighborhoods. Second, they must plan simple block and street networks connected to walkable through streets. For that to happen, a culture change is needed among transportation engineers and departments of transportation. With those changes in place, builders, like KB Homes, will gain experience building neighborhoods—and not just tract housing in the middle of nowhere. It’s not like single-family housing has to be built in the form of sprawl. The mixed-use neighborhood is an alternative with a strong market. In many good urban neighborhoods across America, older single-family houses are snapped up as soon as they come on the market. But the barriers to create these houses from scratch, with the walkable amenities that people want, are still huge. The culture change and experience will take time—a generation or more. Until then, expect to see more single-family sprawl. And builders will struggle to adapt to a new market. By the way, local and national experts on form-based codes, transportation, and real estate markets will gather in Dallas, Texas, April 29 through May 2 at CNU 23 to talk about strategies for meeting the market demand for walkable places. I hope to see you there.